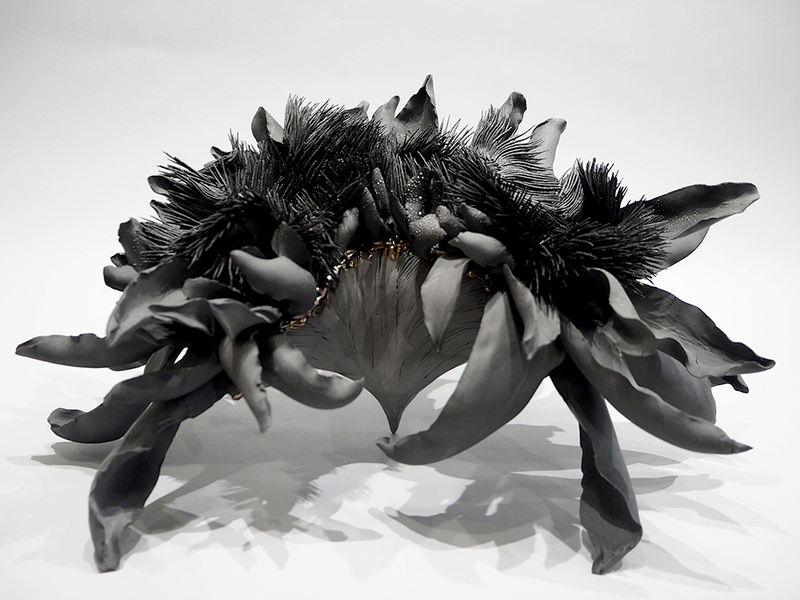 shingu sayaka — Dai Ichi Arts, Ltd.
SHINGU Sayaka is one of the young emerging talents. She is well-known in and outside Japan for her ceramic flower series. 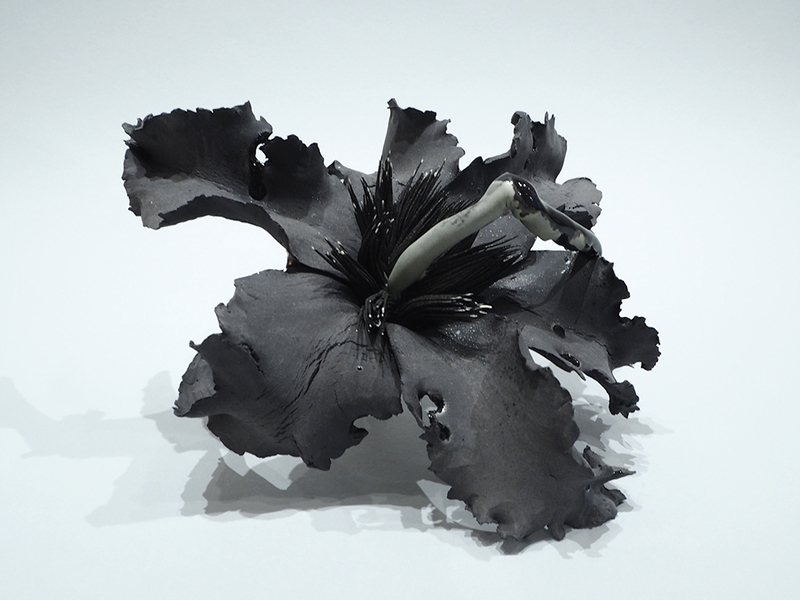 Unlike real flower, her pieces has no vivid color, but black colored clay and white glaze; they project a strong and quiet impression. Flower is an ever lasting theme for artists, most notable in the west are Robert Mapplethorpe and Georgia O'Keeffe to name a few. They might see the cycle of dead ends and fresh starts in flower. As we all know, when we buy flower, it doesn't last long. If flower lasts long, that is no longer beautiful. The beauty is not in existing but in disappearing. In Japan, 無常 (Mujyo/ mutability, uncertainty, impermanence) is one of common sense. People loves 桜(Sakura/ Cherry blossoms) because it lasts not too long. Many arts have been made for that fleeting beauty. One of the six best waka poets of the early Heian period, Ono no Komachi (小野小町 825-900), who was renowned for her unusual beauty, made this poem about flower and her beauty. 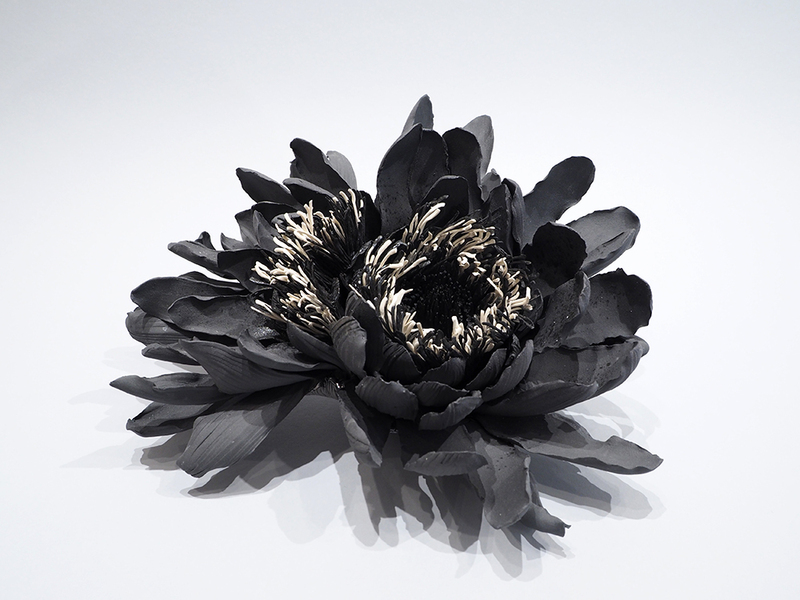 SHINGU's flower is made by black colored clay. When making a form with clay, at the beginning, the clay is fully moist and easy to change form. The texture of soft clay is one of joyful moment for the ceramic artists. But the texture changes every second. The moisture is gradually lost and the piece is dried up. Same as a cut flower, even it looks having full of life, it's dying up at every second. Firing gives eternal life quality to a ceramic piece. Her work represents transience/fleetingness and immortality of life. Inside her piece, there is an androecium which SHINGU makes one by one by her hand. Sometimes thousands and hundreds sticks cover her work. This aggregate part represents the pile of time. 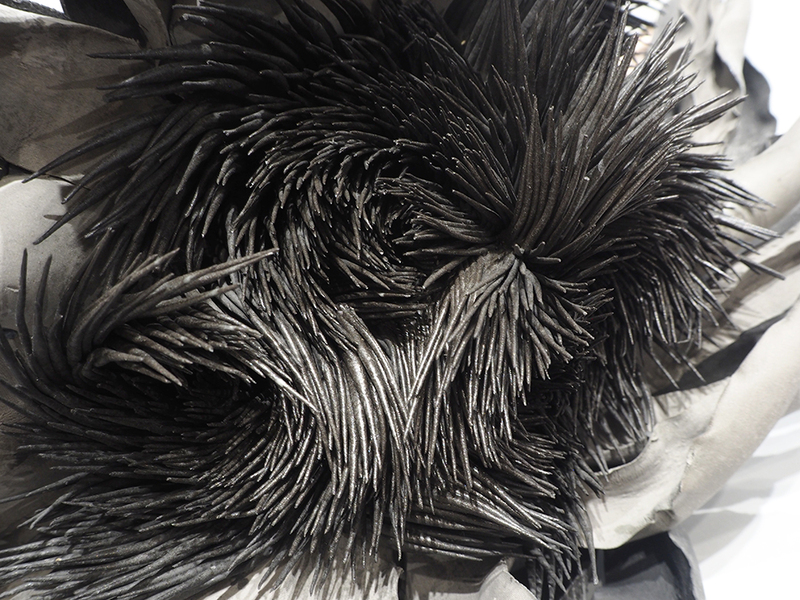 This piece itself is relatively small and delicate piece, but because of this part, it has very strong presence. SHINGU's flower never wither.